MARRAKESH, MOROCCO—In a groundbreaking discovery that could shed light on the origins of the delightful species, anthropomorphologists from Cambridge University announced on Friday that they had unearthed the fossilized remains of the earliest known upright-walking banana. 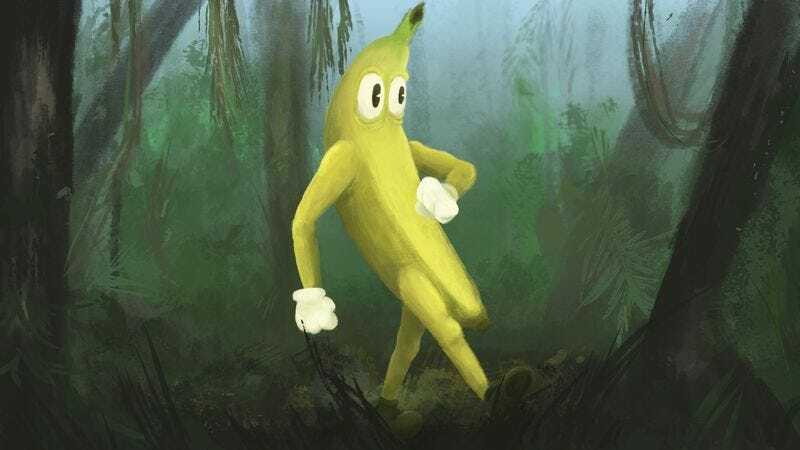 “It appears that bananas were already bipedal near the beginning of the Pleistocene epoch nearly 2 million years ago, an evolutionary development that not only allowed them to walk but also freed their arms to swing merrily as they whistled a tune,” said lead researcher Vanessa Johanson, adding that it was impossible to determine the gender of the specimen, however, as the long eyelashes and oversized hair bow that would indicate a female would almost certainly not be preserved after so many millennia. “Digital reconstruction techniques have led us to conclude that the bananas had large eyes, bushy eyebrows, and wide, toothy smiles that remained fixed in place throughout their lives. But, interestingly, they seemed unable to vocalize puns such as ‘I find you so a-peel-ing!’ which likely means the necessary structures in their mouths and throats developed at a later date.” Johanson went on to say that traces of sesame seeds found at the site suggest the bananas may have had contact with the talking hamburgers that had previously been discovered 30 miles away.